Vidyarambham is a Hindu tradition where children are formally introduced to music, dance, and languages. It involves a ceremony of initiation into the characters of the syllabary. The Vijayadashami day is generally held on the tenth and final day of the Navratri celebrations, and is considered auspicious for beginning learning in any field. The process of learning and initiation on this day is also closely related to the Ayudha Puja ritual. It is usually on Vijayadashami that the implements kept for puja are taken up again for re-use. This is also considered a day when the Goddess of learning, Saraswati, and teachers (gurus) are revered. The ceremony of Vidyarambham (Vidya means "knowledge", arambham means "beginning’) for children is held in temples and in houses. It is common practice for thousands of people to visit temples to initiate their children into learning. Initially, the mantra is written on sand or in a tray of rice grains by the child, under the supervision of a master who conducts the ceremony (usually a priest or a guru). Then, the master writes the mantra on the child’s tongue with gold. Writing on sand denotes practice. Writing on grains denotes the acquisition of knowledge, which leads to prosperity. Writing on the tongue with gold invokes the grace of the Goddess of Learning, by which one attains the wealth of true knowledge. The ritual also involves an invocation to Lord Ganapathy for an auspicious start to the learning process. Nowadays, the Vidyarambham ceremony is celebrated with variations in the rituals that are followed. Saieesha is about to embark on her formal education. 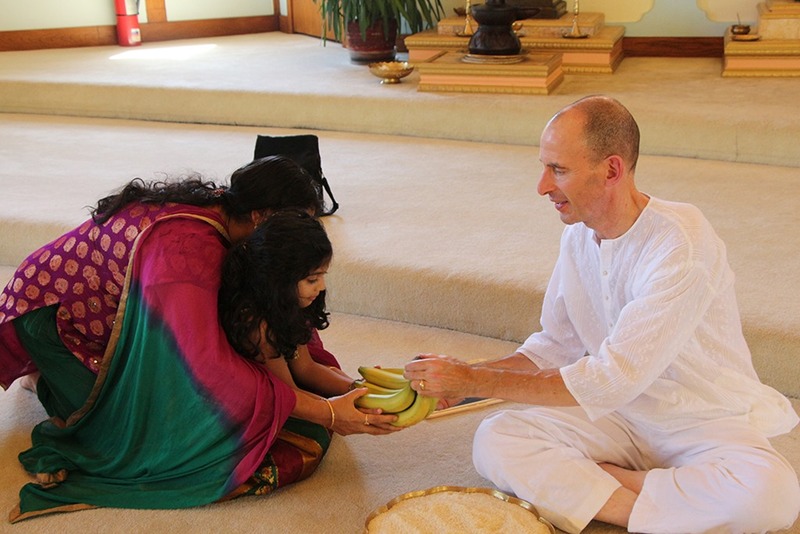 Saieesha’s Vidyarambham ceremony was performed in the SAT Temple Satsang Hall on Sunday, September 6, 2015. Saieesha first addresses Nome with OM NAMAH SIVAYA, that she repeats several times. Saieesha then holds a gold ring in her hand and Nome takes Saieesha’s hand guiding her while she writes AUM in the rice with the gold ring. Saieesha concentrates as she writes with the guidance of Nome and the assistance of her father. AUM HARI SHRI GANAPATAYE NAMAH and AUM NAMAH SHIVAYA are then written in the rice. 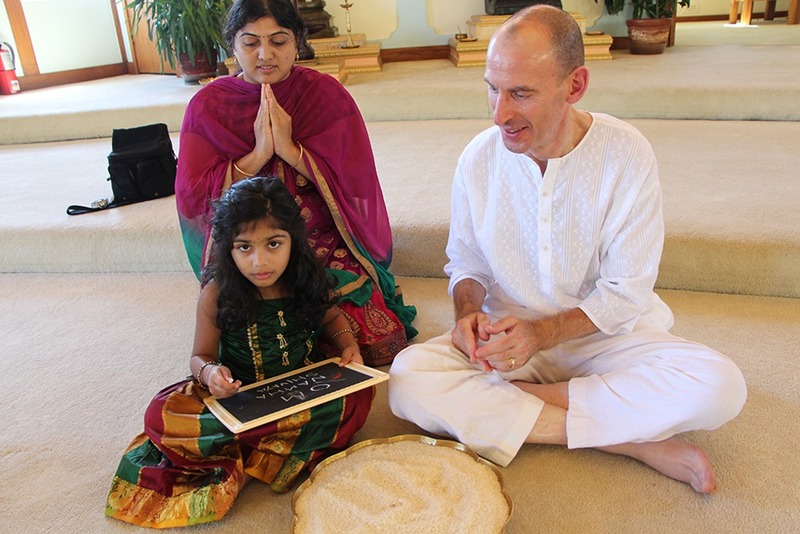 Saieesha’s mother and father, Jyothi and Raghunatha, assist Saieesha in writing OM NAMAH SHIVAYA on the slate while Nome looks on giving blessings. 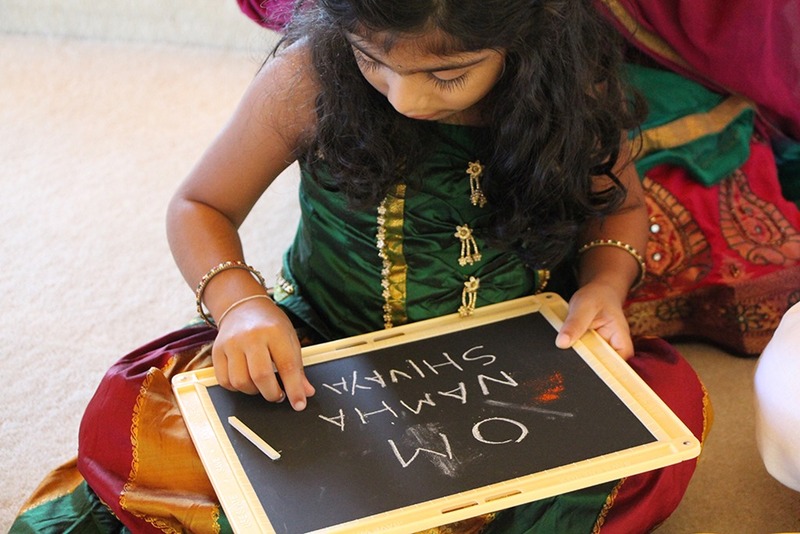 Saieesha is anxious to write more on the slate. She will be a good student! Saieesha and Jyothi offer prasadam to Nome. Nome takes the prasadam and blesses it. The blessed prasadam is returned to them later. 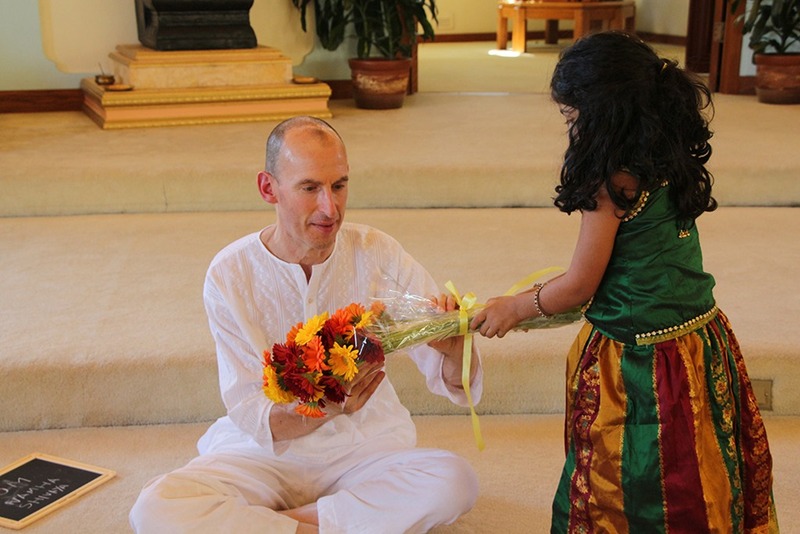 Saieesha offers flowers to Nome and they are placed on Ramana’s altar in the front of the Satsang Hall. 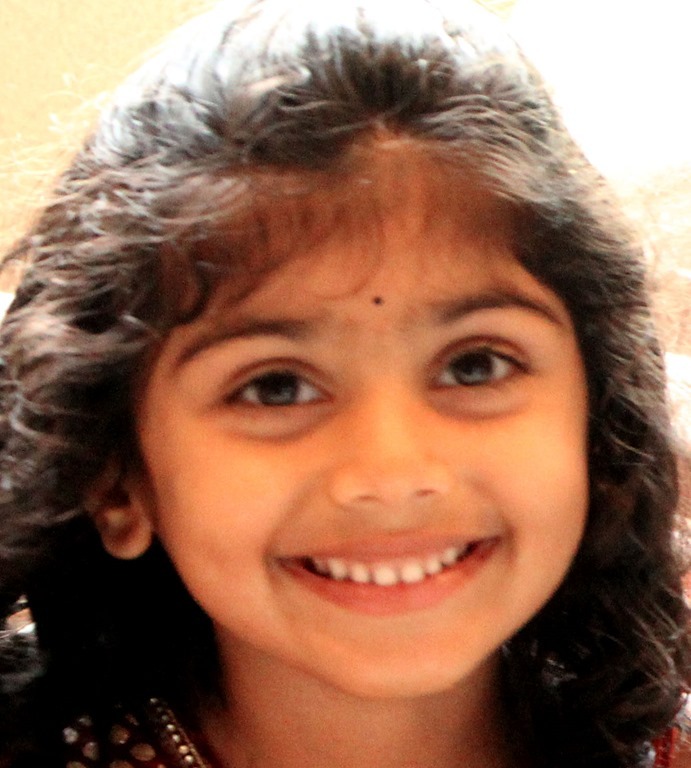 Saieesha’s Vidyarambham is completed and she is ready to learn. Thanks for this wonderful gift! Om Namo Bhagavate Sri Ramanaya! Om Namah Sivaya!